Call now and receive a $20 discount off of initial service with mention of this website. Also, ask about our referral program for additional savings! "Jeff Reddish with ASAP Pest Control has been doing my Pest Control for years now. He does an excellent job. He is always on time. He is licensed and insured and no mistake of who he is when he comes with his truck having the business name and he being in uniform with company name. The product he uses is awesome being that there is no bad odor and does a great job. I highly recommend ASAP Pest Control !!!!" Insects and termites bugging you? Stop waiting and worrying. Call an expert. Your ASAP Pest Control technician is trained to identify your pest threat and risk areas, then treat the causes in ways that are best for your family, pets and the environment. After a comprehensive inspection, we'll create a customized pest control plan that effectively targets cockroaches, silverfish, ants and common household pests exactly where they appear in your home inside and out, all year long. We can also address any flying insect problems you may have. 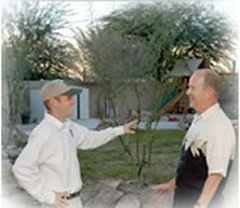 Great pest control is about excellent service. Service is always about respect. We treat your home as if it were our own. Family is important, and at ASAP Pest Control keeping them safe is our priority. We care about your family's health and safety, as well as respecting the environment! We provide a smarter approach and safer solutions for all of your pest control needs. 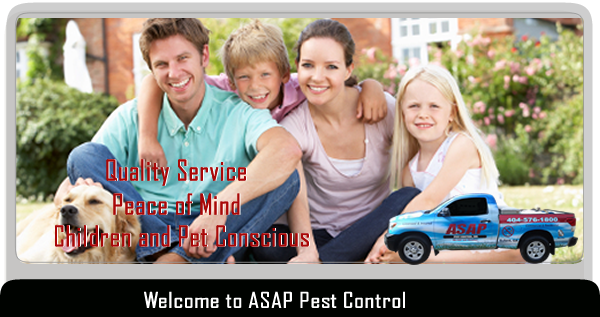 You will feel good about your ASAP Pest Control service. You care about your home environment. So do we. So, don't just call an exterminator. Call an expert in your neighborhood, ASAP Pest Control.